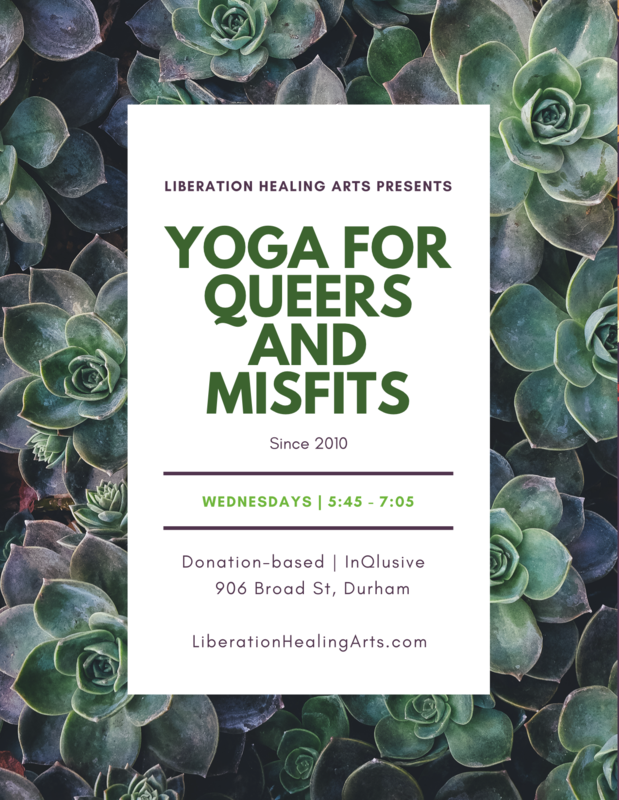 Go here for more on my weekly yoga classes in Durham. I believe (in) you, a healing space for survivors. More info and sign-up here. Sign up strongly suggested. Using the tools of yoga to sustain us. Theme: Shining the Light – Yoga and Racial Justice. I will be offering the keynote address. There are also workshops available throughout the day. Go here and here for more info and to register. *Sign up for the whole series and receive two special offerings. Details below. An 8-week series combining mellow and restorative yoga, breathwork, and the wisdom of Ayurveda to support your seasonal transition and overall health. For many, the transition to Fall is a rough one. It can include increased insomnia, agitation, a seasonal down-turn, disrupted digestion, and overall diminished energy and quality of life. Additionally, Fall’s increase in air energy adds to that which we already have in excess in our dominant culture – overstimulation, constant shifts and changes, and overall hypermobility. Ayurveda tells us that like increase like, and the way to find health is by balancing the internal and external energies. This series is designed with this principle in mind: an understanding that the microcosm is a reflection of the macrocosm, and if we are to stay steady and enjoy ease (i.e. prevent dis-ease), then we must continue to respond to conditions and adjust how we tend to ourselves. We must acknowledge that how we care for ourselves from season to season must also shift. If you struggle with anxiety, restlessness, agitation, “monkey-mind,” or other common imbalances of this type, this series is for you. If you are seeking to incorporate more ritual and reflective into your life, this series is for you. If you are looking to find more balance and ease in your life, this is for you. In order to assist in balancing the energies of Fall, this class will be a calmer and more meditative space than my other regular yoga offerings. It will include moderate yoga asana, breathing and meditation practices, as well as an exploration of the role of the psoas and its relationship to a healthy nervous system, a strong center, and an overall experience of groundedness. The psoas is the first muscle to contract in fight/flight/freeze response, and it therefore is directly linked to our trauma and threat responses. By working to progressively release, balance, and engage the psoas, you’ll find a deeper sense of well-being, centeredness, and connectedness. Additionally, each week we will discuss a different tool or technique from Ayurveda, yoga’s “sister science,” for assisting in an easeful transition by supporting balance. These will be food and lifestyle recommendations that will foment deep nourishment, such as abhyanga (self-massage) and other restorative practices. *You can drop in to any single class, but the greatest benefit will be obtained by committing to the whole session. In this way you will be able to progressively incorporate the tools and practices and experience optimum ease. For those who sign up for the whole series by Monday, September 4th, I will also be offering a few extras. A cotton-covered eye pillow to support restoration and contemplation. In addition, those who book the whole series will receive a free and personalized guide to managing your doshas. The dosha is your “biological humor,” the unique combination of the five elements that are present in you. Learning to understand your nature through the doshas is fundamental to embracing a lifetime of health. In order to take advantage of this offering, you must be willing to complete several dosha self-assessment materials which I will make available to you via email. That should take about 20-30 minutes of your time. Patanjali’s Yoga Sutras tell us, “sthira sukham asanam.” When we get steady in a good space, when we can get ourselves calibrated to ease and not dis-ease – to balance and not imbalance – then our life force will flow and we will experience the profoundness of being centered and grounded. From this state of dynamic health, everything else will flow. On Facebook here – please share. This is a challenging time. Many of us are still reeling, still cycling through trauma and grief responses. This is absolutely understandable and totally appropriate – get what you need in this time! Many of us also need spaces that help us accept the truth of what is right now, and help us practice interrupting the kinds of oppression and violence that are increasing in this era. We need practices which help us understand our own fear responses, for understanding how to gauge safety vs. comfort, and for increasing our capacity for engagement. Encourage folks to understand what bold and courageous action looks like for each of us right now, and figure out ways to support that going forward. Based on feedback from the first time offering this workshop on 11/20, we’re sharing this framework as well of what the workshop isn’t and what it is (or aims to be). These things are all valid, they are just not primarily what the Embodied Anti-Oppression Practice workshop is about. If you’re interested in the above, there are will be upcoming opportunities to engage in some of these.